October 11, 2018 -- Researchers from Taiwan have created 3D-printed models of rib structures based on chest CT scans to facilitate presurgical planning for rib fracture stabilization. The technique led to reductions in operating time and length of surgical incisions, according to an article recently published online in PLOS One. The group, led by first author Dr. Ying-Yi Chen from the National Defense Medical Center in Taipei, set out to improve various aspects of the surgical stabilization of rib fractures using 3D printing technology. Traditional methods for this type of rib fracture repair often require clinicians to make a large incision and spend a considerable amount of time attempting to visualize the fractures before implanting titanium plates, the authors noted. To meet these challenges, Chen and colleagues developed a 3D printing approach to facilitate the presurgical planning of rib fracture repair for 48 patients who had undergone CT scans at their institution between July 2015 and December 2017. The surgical team used either the 3D printing approach or a conventional technique to plan the surgery for each case (PLOS One, October 4, 2018). 3D reconstruction of chest CT scans (a). Model of 3D-printed rib used to measure the ideal length and shape for the titanium plate implant (b, c, d). Image courtesy of Chen et al. 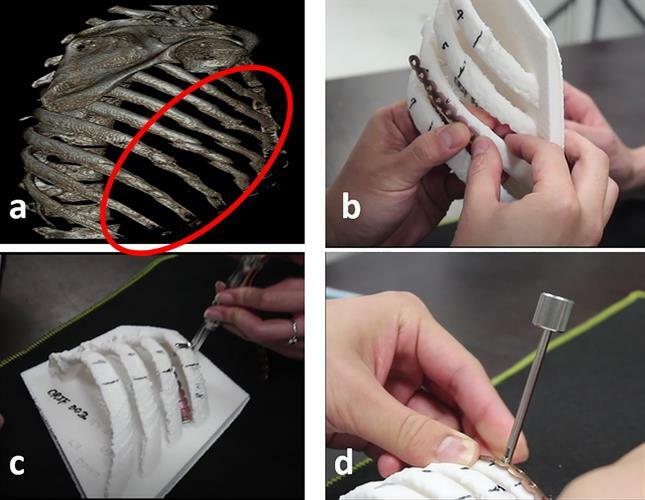 To create 3D-printed models of the rib cage, the researchers used computer software to make 3D reconstructions of the chest wall from the patients' CT scans. Next, they used a 3D printer (Up Box+, Denford) to produce the 3D-printed rib cages and acquired relevant measurements of the models using a standard caliper. Preparing for rib fracture repair with the patient-specific 3D-printed models enabled the clinicians to determine preoperatively the appropriate size and curvature of the titanium plate implants and screws needed to stabilize each patient's rib cage. Ultimately, this decreased the length of the incision surgeons had to make for the operation. After successfully completing the surgeries, Chen and colleagues found that the 3D printing approach, in comparison with traditional methods, had a statistically significant association with shorter operating time (average of 35.41 minutes vs. 52.99 minutes per rib, p < 0.001) and smaller incision length (average of 8.71 cm vs. 14.19 cm per rib, p < 0.001). "3D printing for surgical stabilization of rib fractures is a safe and practical technique because of no complications ... significantly shorter operation time and an appropriate incision length," the authors wrote. Despite these advantages, 3D printing may not yet be suitable for emergency cases due to the long processing time required to make the models. Fabricating the 3D-printed ribs on a rapid prototyping 3D-printing machine took five to six hours and cost approximately $100 to $200 per model, in addition to the cost of the materials. The 3D printing approach may become more feasible and valuable for rib fixation surgery as the technology advances and becomes more accessible in clinical settings, the authors concluded.